Do you lean toward scrappy quilts or more controlled palettes? 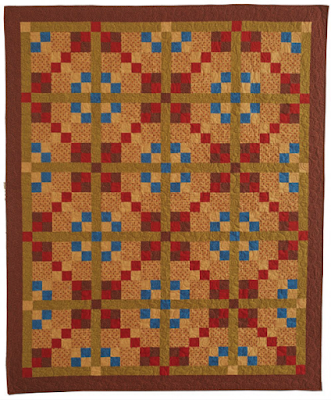 Today we're sharing two Waddington Roadquilts designed by Barbara J. Eikmeier. 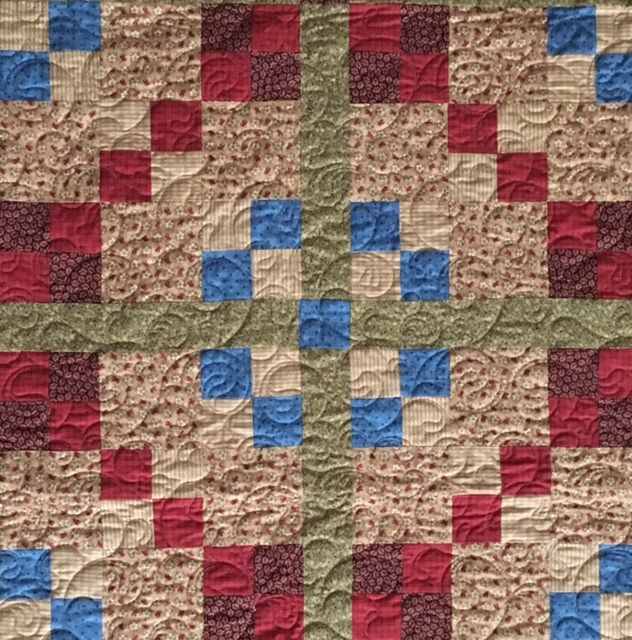 Many of Barb's quilts we've seen have been scrappy--a cheery collection of reds, blues, greens, golds and tans. These two quilts showcase the Waddington Road fabric collection in a very different way and we asked Barb to talk to us about her designs. We think you'll love them both! 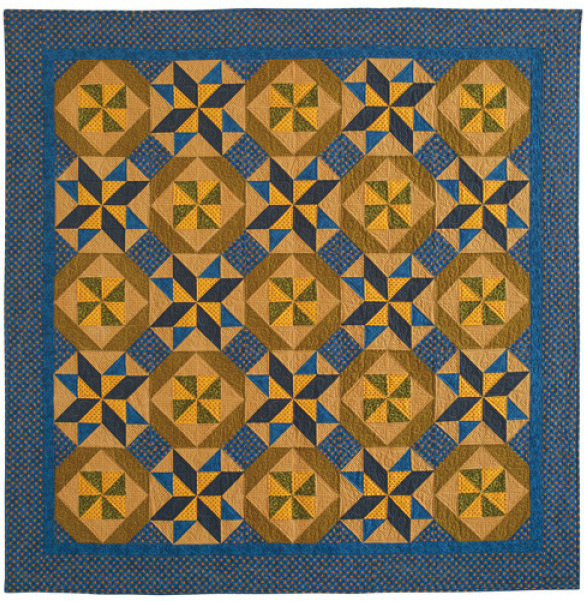 The "Homeward Winds" quilt uses a warm palette of blues, greens, and golds, with a tan background. This two-block design is easy to sew and creates a secondary design. This lap-size quilt is featured in the March/April 2018 issue of McCall's Quilting magazine. Q. How did you come up with this design? BE: The magazine editor had requested a two-block design. 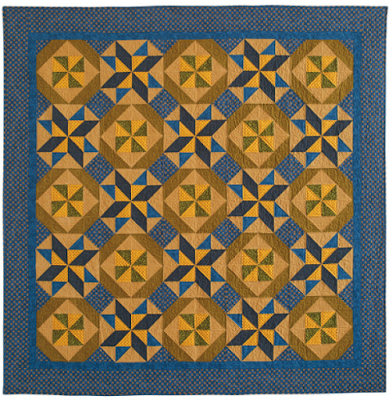 I had used the pinwheel star block (all blues) in a previous design and liked it, so I searched for a second block that would work well with it. When I found the framed pinwheel block (green), I realized that the corner triangles would match up and create a secondary shape. I didn’t realize both blocks started with center pinwheels until I recolored them! Q. How do these blocks go together? BE: Beautifully! If you press the corner units in opposite directions, they lock together when you pin the blocks and create such nice corners! Q. What’s something we might not notice on a first look at this quilt? BE: Do you see the spools on an angle? They’re where four blocks come together and they’re made up of blue thread centers with olive green tops and bottoms. I love that this little design element emerges! Q. Tell us about your color choices for this quilt. BE: Waddington Road has so many color variations, and it works well in scrappy quilt designs. As I’ve worked with these fabrics, I’ve often pulled smaller groupings that I thought looked pretty together. I really liked this blue, green and gold combination. Using the same yellow in both blocks creates continuity throughout the design. The inner blue border is subtle, but creates space between the blocks and the outer border. It let’s the natural edges of the block stand out. Q. Tell us about the quilting. BE: I asked Theresa Ward to do custom quilting because the quilt has some areas that would really shine. She did swirls on the olive green sections that show up beautifully. Q. What do you like best? BE: I like the spool design that emerges when the blocks come together. This is a straight-set quilt, but you get diagonal components that make it look more interesting. 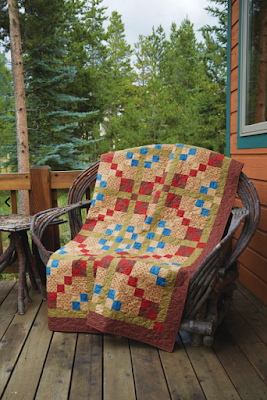 Find the Homeward Winds quilt pattern here. See the entire Waddington Road collection here. Find McCall's Quilting magazine here. 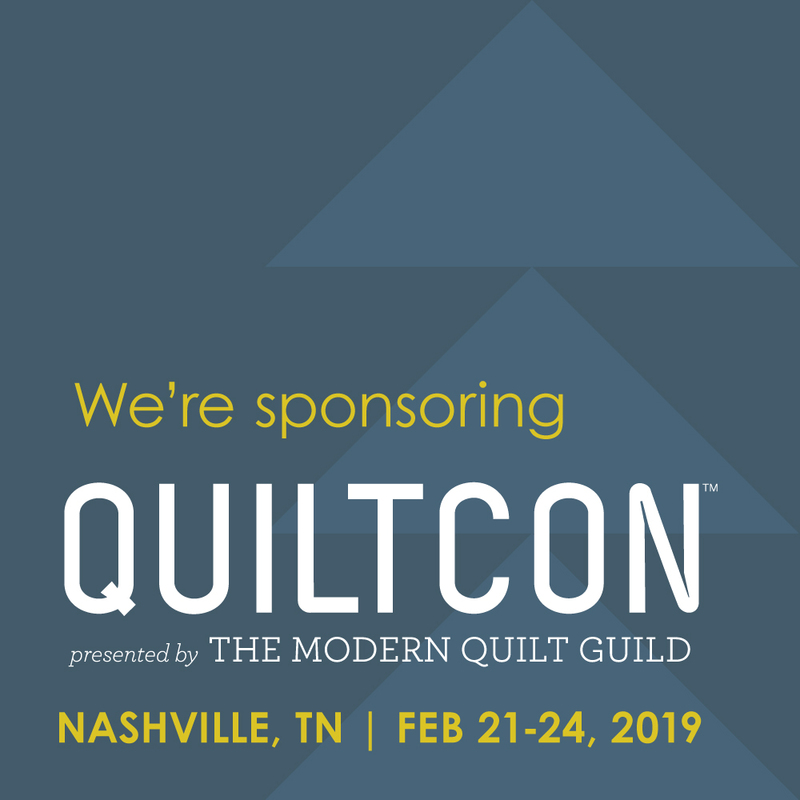 Contact the Quilt Corral to purchase a kit for Homeward Winds. Barb's "Grandma's Farm" quilt goes in a totally different color direction. Bright red and blue prints stand out from tan, olive green and chocolate brown coordinates. The quilt is made using simple four-patch units--an easy design that creates a visually interesting quilt. 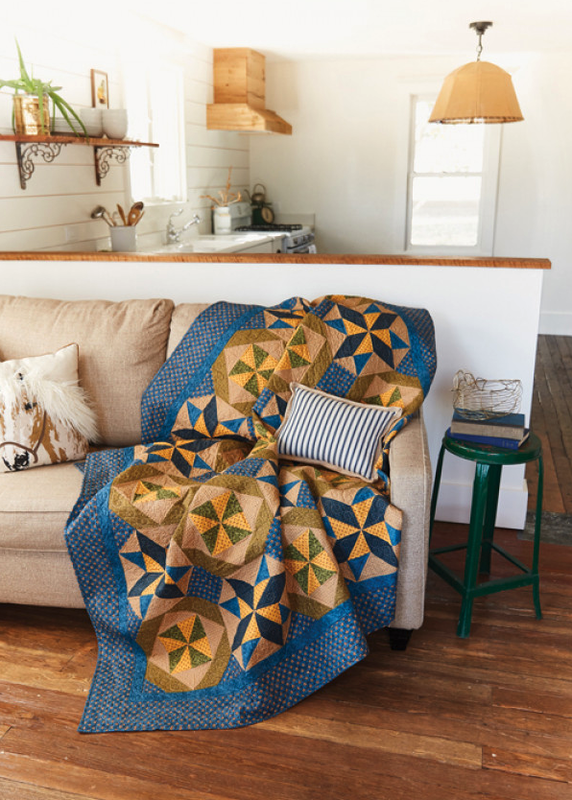 "Grandma's Farm" is featured in McCall's Quick Quilts February/March 2018 issue. Q. 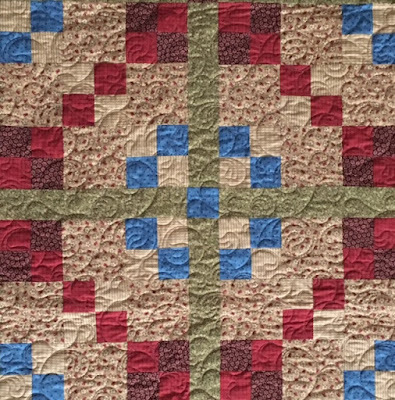 What inspired this quilt design? BE: It’s named after my Grandma who lived on Waddington Road. The design itself is the idea of a chain link fence going around a farm, and it’s made up primarily of small four-patches. 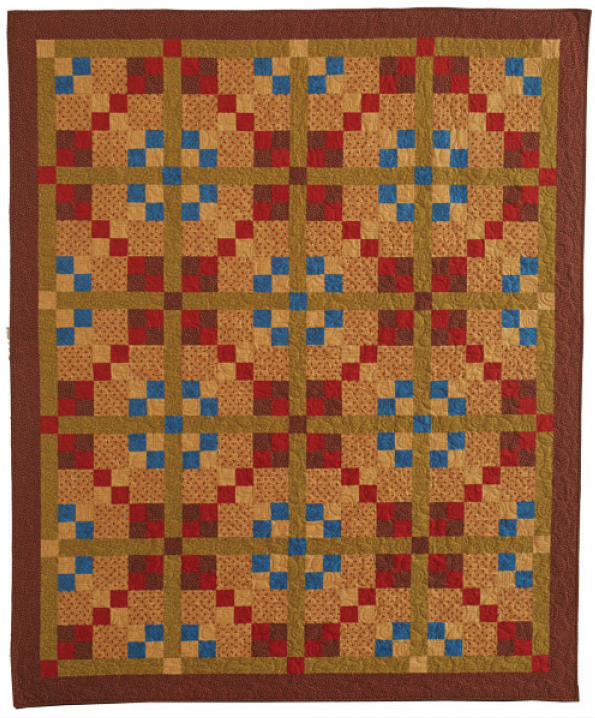 The overall design is a nine-patch variation. Q. Tell us about the color palette you used. BE: I started with the background floral print, with small red and brown flowers. Then I added red and chocolate brown prints, plus the lighter tan, and they all coordinate beautifully. I wanted to add another color that would stand out. The blue really made the design come alive. The sashing is an olive green, which stands out as well. I changed up the sashing cornerstones, with adds a secondary design as well. Q. What do you like best about the quilt? BE: I like how the secondary blocks show up by the cornerstones—a phantom nine-patch design. When you look at this quilt, it’s a really simple pattern, but the more you look at it, the more interesting it becomes. Find the Grandma's Farm pattern here. Find McCall's Quick Quilts February/March 2018 issue here. Grandma's Farm is a fabulous way to use 4 patches. Great quilt! Aren't four-patches great to sew with!? We love them, especially in this quilt. Make a pillowcase; make a difference!